There is still plenty of good Greyhawkian articles coming out this Fall. The latest is by Rasgon, one of Canonfire's premier scholars. His work, The History of Ahlissim is an insightful take on the origins and lore of the ancient Flan people of the Ahlissa (South Province) region of the Flanaess. This article has everything you'd expect about this little known era including the deities Zodal, Joramy, the fabled artificer Xagy, plus of course Queen Ehlissa and her Marvelous Nightingale. DMs, there is many lost secrets to be found here to spice up your Greyhawk campaign. Enjoy! Oerth Journal #26 Almost Released! Over at Canonfire there is more new Greyhawk fiction to be had, this week by Leahcim the Learned. His work, Of Ashes and Empire, is a classic tale of knights, dwarves, orcs and even darker foes, all clashing in one action packed short story. Give it a read and enjoy! "The Kingdom of Aerdy, once the jewel of Oerth spanning the continent falling to decadence and finally to memory. But as one wise learned man once said 'Sometimes ashes hide an ember to start a fire anew'. This is a story of one such ember..."
"Rune Lore is the formula Rune casters use in the crafting of a rune. Unlike traditional forms of magic in which a caster invokes certain ritual’s to shape the magical weave." These articles are perfect for anyone wanting to run an alternative spellcaster from dwarven or northern cultures, particularly the barbaric northeastern (Thillonrian Peninsula) region of Greyhawk. Enjoy! This week begins a new column entitled the "Ring of Five Questions" in which I hunt down notable authors and fans of the World of Greyhawk, to ask them five setting specific questions of a ponderously nostalgic nature. Starting us off is one of the best authors to come out of the old Living Greyhawk Campaign, Creighton Broadhurst. Creighton is primarily known for his work with Living Greyhawk Onnwal as well as his articles and adventures about the schemes of Rary in the Brightlands. 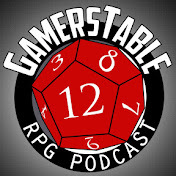 Nowadays Creighton is part of Raging Swan Press where he creates Pathfinder RPG compatible game products. Enjoy! Q1. As a long time Greyhawk fan, you should know the Darlene map by heart. What is your realm of choice in the World of Greyhawk? 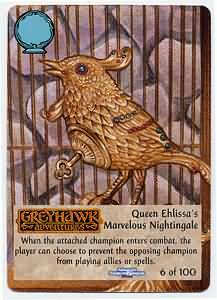 Creighton: I have a lot of good memories of Onnwal because of my time in Living Greyhawk - I made some very good friends in LG and had some great games! I'm also becoming very partial to the Great Kingdom - and its successor states; most of my recent campaigns have been set there. Q2. If you could be one Greyhawk deity which one would it be? Creighton: Boccob. I almost always play wizards, sorcerers and the like so it would be cool to play at being the best wizard ever! Q3. You published alot about Rary for Living Greyhawk. What NPC/organization would have been your second choice for a major storyline? Creighton: Rary was actually my second choice! Originally, when we were casting about for a major core plotline I got very interested in exploring the ruins of Medegia. It's an area ripe for development and we could have explored some very apocalyptic themes. I think adventures in the ruins of Pontylver would have been particularly cool. I even had an article basically ready to go for the Living Greyhawk Journal (which later saw the light of day in the Oerth Journal). Eventually, however we decided that the plot would have been too regional in focus - in that Medegia isn't exactly central in the Flanaess and its plots would have focused a lot around the Splintered Sun meta-region. Q4. Is there any Greyhawk module that you wish you had never ran? Creighton: No, but there are lots I wish I could run. I really, really want to run GDQ1-7. I've played it twice, but never DMed it. Sadly, my current group has a player who has just run it as a DM and thus knows it rather well. I'll have to bide my time. I'd also like to make my players forget the Temple of Elemental Evil and run that again - it's one of my all-time favourite modules, but sadly we all know it rather well. Q5: There's a vacancy in the Circle of Eight. Which NPC wizard would you pick to fill the spot? Creighton: I guess that depends on what year it is! Assuming it's after Return of the Eight, I'd add Graf Reydrich (from South Province [Ivid the Undying]). His write-up includes a very interesting snippet about him pleading to join the circle 15 years ago (so around 569/570), but that he was rebuffed by Mordenkainen. That really intrigues me; after all Tenser was on the Circle for some time and he wasn't exactly neutral. It would be interesting to see how Reydrich's influence would be felt in the policies of the group. Yeah, sorry folks, this isn't about Greyhawk, but I can't help but post about my second favorite pastime, baseball. This weekend the St. Louis Cardinals won the National League pennant and will face the Texas Rangers of the American League in the World Series. Why is this victory significant to me? 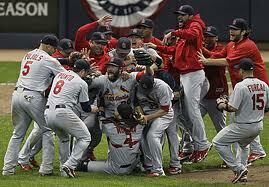 Besides being a fan of the Redbirds all my life of course, this League Championship is historic. Just for fun, I'll try to put it in terms even a gamer can appreciate; in the realm of sports stats the Cardinal's season was improbable as the most improbable of D&D events. To start, the Cardinals lost their ace pitcher in spring training. This would be like the DM taking away your Fighter character's best magic sword before the adventure starts. The Cardinals pushed on and by the mid point in the season (80 or so games) they were flagging behind in 3rd place behind the Brewers and the Pirates due to a terrible closing pitcher who kept blowing their wins. Imagine now your Fighter is trying to defeat say...pirates in combat (with his second best magic weapon) but he can't win because his team-mate the affable Bard can't seem to get the finishing blow. The closer was dumped, new pitchers were acquired to fill in and the Cardinals hung in there- and with the strong bat of the "comeback player of the year" they started to climb back up the standings. This was sorta like dropping the Bard, getting a new Rogue's gallery of elves, halfling and dwarves, then the old Cleric of the group suddenly acquires a Girdle of Storm Giant Strength and heals the entire party back to maximum hit points. The Cardinals being the wild card had to play the best team in the first round, the Philadelphia Phillies. The same Phillies who won 102 games and were the best team in all baseball, all season long. Their line up is a veritable all-star team, especially in the pitching department. In comparison, your Fighter sizes up the Dragon and realizes it is not only a Great Wyrm, but it has multiple attacks per round, each doing enough damage to kill a PC in a single hit. Do the Cards back down? No! They out play and out maneuver the Phillies, taking them to the deciding final game where the Card's #2 pitcher (arguably #1) put on the game of the season, defeating the Philly's #1 pitcher in a complete game duel, ending in a 1-0 Cards win. This is like the Fighter, the Cleric, and the cast of demihumans all wounding the Dragon but falling in combat anyway. But not all is lost, the party Wizard drinks a Potion of Heroism, picks up the Fighter's magic sword-then goes toe to toe with the creature for nine rounds, eventually rolling a "natural 20" to kill it. The Cardinals advanced to the second round to face the Milwaukee Brewers, who won their division and looked to be every bit as potent as the Phillies especially with their home field advantage and MVP players. The Dragon was slain and it was time to take the treasure home-but no! There was still the matter of getting out of the lair and defeating the evil Guild who now waited outside to steal your hard fought loot. The Cardinals from the get-go lost the first game and it sure looked bleak, but they stole the second game and from there it seemed the Brewer's confidence was shaken. They were out scored, out pitched and worst of all made way too many errors. In the end, it was the Cardinals relief pitchers who stole the show not their starters. Back in D&D, your Fighter, all levelled up from the Dragon encounter, faced the Guild's best henchmen and mercenaries. Sure they traded blows at first but then the villains started to roll an improbable string of "natural 1" fumbles sealing their own doom. The dependable demihumans jumped in and finished the Guild off with ease after that. Yes, anti-climatic compared to the Dragon's lair, but a victory nonetheless. The Cardinals, written off by most experts and even their own fans (Yeah me too) made it to the World Series! I say, what more do they have to do to win it all? Here's to hoping that Fighter gets to bring a big trophy back to his castle when this quest is over! Update (10/28) Welp...the Fighter brought the trophy back to his castle after all! But first, he had go through an Epic Ranger who was barring his way. At first the Fighter was dishing out big damage, but then the Ranger had the upper hand with two straight rounds of punishment. Then miraculously the Cleric's young protege stepped in and TWICE healed the Fighter back up from near death at -2 hit points. The Fighter summoned up his best critical swing and killed the Epic Ranger in the seventh round. Classic! Now that I've grabbed your attention, I'm sorry to inform you this post is about the novel Master Wolf by (shudder) Rose Estes. 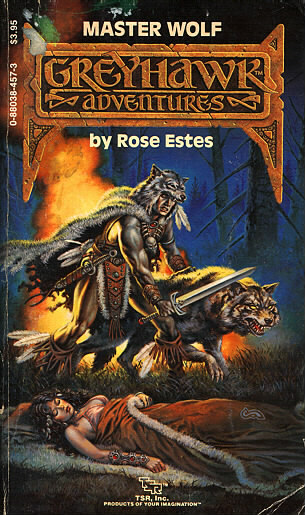 For anyone not familiar with Rose Estes, well she is notable for writing many of the popular Endless Quest books for TSR back in the day. This of course led to her being put on fiction for the Greyhawk setting (following on the heels of Gygax's Gord series) for which she is now and forever reviled by all corners of the community. Why is her Greyhawk novels hated? I won't go into that now, but you're better off not knowing. Now I don't advocate book burning by any means even if it has Rose's name on it, so when I found a few of her Greyhawk novels in a library book sale years ago my goal wasn't to destroy them, but they sure have collected alot of dust. It's probably more because of the Greyhawk Adventures logo that I bought them since I'm a Greyhawk hoarder. Anyhow, on a random whim I finally opened one up with no intention of reading it, but instead to look at the art. Here, might be the silver lining to this book. The cover above is by Clyde Caldwell whose richly colored paintings can be found throughout D&D on countless covers for modules such as the classic Ravenloft, and settings such as Dragonlance, Forgotten Realms, Mystara and more. His style is similar to contemporary Larry Elmore, but the way to spot a Caldwell painting is easy, just look for all the freakin huge gems on his character's weapons and jewelry. The interior art is an interesting find as well. 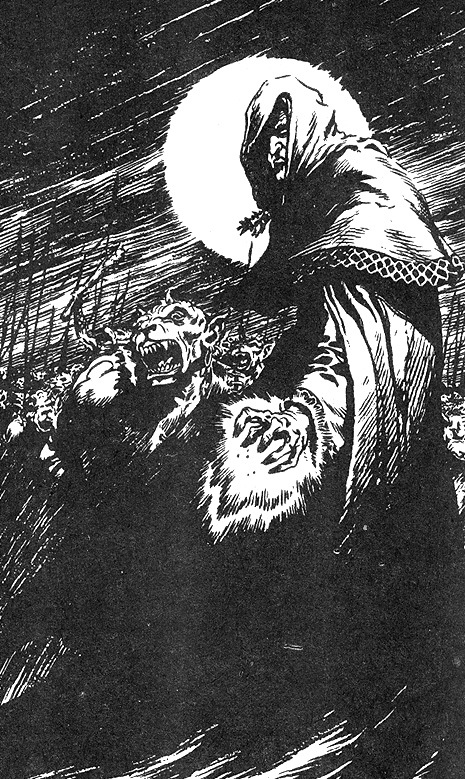 Master Wolf contains a few black and white illustrations by a guy named Bart Sears. For those who don't read comics, he is a fairly famous comic artist primarily for his work on Justice League Europe. Surely Sears was still working his way up in the field when he got commissioned by TSR. This book came out in 1987, two years before his career boosting run on JLE. His bio mentions nothing about his work for TSR. I'd try and forget it too if it was for this novel. "How do I define ‘living life to the fullest?’ I define it as doing what I want, to who I want, when I want to, because it brings me pleasure. -Khuludden the Bloodstained, priest of Erythnul." The lorekeepers at Canonfire! have yet another new article up for your consideration. Gods of the Flanaess: Erythnul, is the 91st article by the stalwart Greyhawk scribe CruelSummerLord for Canonfire and it doesn't look to be his last. 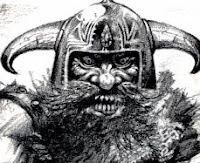 This study into the history and teachings of the god of slaughter's religion is a continuation of a long series by CSL which has included many of the most popular deities used in the World of Greyhawk setting. It is a worthy read for any DM or player who is intrigued about using this chaotic deity worshipped by both men and humanoids alike. "In Secret of the Runes, we found out about the origin of Rune Lore. In this long awaited follow up to the Postfest IV article, we will address the lost Joten magic’s and an alternate Wizard class called the Rune Caster, plus some Rune Feats." I know I've harped and commented on Wizards of the Coast's 4th edition accessory, Mordenkainen's Magnificent Emporium for nearly two years since it was first announced at Gencon, but the book is finally out so I think I can put this one to bed. Well, not before I have one last poke at it for fun however! For a good review of the Mordy's Emporium check out this article by Neuroglyph over at ENWorld. I'm being lazy and I admit it. I haven't been able to keep up a one comic a month pace since switching to the blog routine. At times I contemplate calling an end to my parody comic so I don't have to torture myself creatively, but then again I don't want to completely drop any source of content for this site either. I guess for now I'll stick with it until a better idea comes along. One idea I did have fun with was parodying the dialogue in other's fantasy art. One such series I ran a year ago was the old D&D adverts that used to run in comic books. Have a look back and in the meantime, (while I stall for a new comic to show you) I'd be happy to poll for ideas on something Greyhawk or D&D related I could lampoon on the site. Enjoy.